I’ve shed more tears in these last seven months since moving to “middle earth” than the last ten years combined. Is that pathetic, or what? Aside from all the tears spent over moving to a new state, missing friends and all the fun things associated with living at the beach, dealing with the hideous insects and dreadful weather here in middle-earth-land…and, not to forget the lingering trauma of being attacked by an 80-pound basset hound, these last three weeks have been, in a word, lacrimonious. Three weeks back it was because of the knock-me-flat-out shoulder and back pain; the spasms were so intense that I spent the better part of a weekend writhing in pain on the floor crying like a baby. I recall telling hubby that childbirth was much easier. Tennis balls, the foam roller, Aleve, and hot patches defined my world for two weeks. Yep… the whole back thing took two weeks out of my life; no exercise, few enjoyable outings and lots of hot Epsom salt baths (truthfully, that part….not so bad!). Then last weekend the episode of season three’s Downton Abbey. “Oh my God, No!” I’m yelling at the TV scaring my slumbering poodle. Why is it that these good, wonderful characters go through hell and high water to find love and happiness and once found, they are killed off?! I couldn’t believe I shed a few tears over that episode. Moreover, I couldn’t believe how angry I got over the whole story line. Really Cristina….don’t you have anything better to do than get caught up in these TV dramas? What would people think? A-ha…I feel some validation in that I am not alone. Facebook confirms this and peeps are all A-Twitter as well over Matthew’s demise. 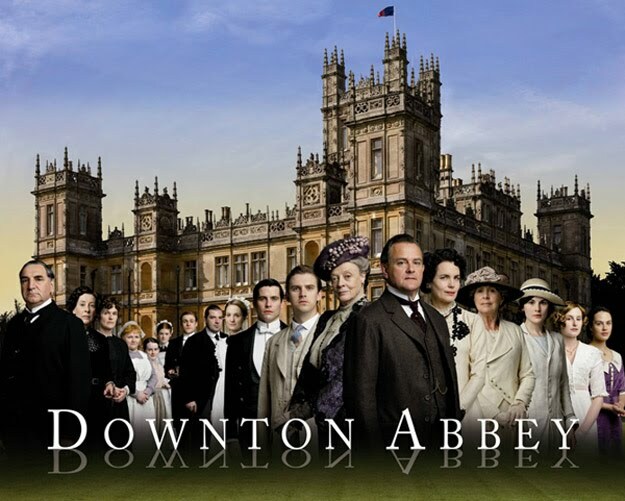 Downton Abbey has indeed become quite the global sensation. So, I shrugged off last Monday’s malaise over Matthew’s tragic death by car accident, one that leaves his beloved Lady Mary without the love of her life and alone to raise their newborn baby boy (heir to the entire Downton estate, to boot!) and I soldiered on through the week only to be knocked over again today with Claire’s death on the popular Australian drama McLeod’s Daughters. I got hooked on this drama via Netflix a couple of months ago. What else does one do while eating many dinners alone when hubby is away on business travel? Anyhow, part of the allure of this drama for me is that Australia has been on my places-to-visit-before-I-die list for years and while this is a drama about ranching and sheep farming (e.g. not the wonders of the Great Barrier Reef) I love the strong female roles and the fact that these women aren’t made up to look “television beautiful” with loads of jewelry and makeup while shearing sheep, rounding up cattle, fighting fires, or cleaning poop out of the stables. Rather, they are portrayed realistically as hard-working (albeit very beautiful) farm women with all the dirt, grime, mud, and sweat that goes along with that kind of life. I should have seen it coming. I mean, here the principal character (that would be Claire) is finally with Mr. Right (that would be Alex) and she has a beautiful infant daughter; Life on the farm, Drover’s Run, is humming with happiness, and prosperity for the struggling farm is no longer a pipe dream. So, they let the Aussie boot drop, well…both of them if you ask me! No happiness allowed! Let’s ruin it all by sending Claire’s truck careening off a cliff with sister Tess screaming hysterically (whilst holding Claire’s baby) and obviously completely helpless to prevent the truck from falling off the cliff. I felt I was in the truck! Here I am, standing in the kitchen yelling at the image of Claire dying on my little iPad….”No…No…No!” And then the tears. I could not stop crying! Ridiculous, I know! “For heaven’s sake, this is just a silly TV drama” I try to tell myself. But I could not stop crying; the tears kept coming for a good ten minutes. So now I have eyes that are swollen and red and there’s a wad of tissues crumpled on the counter and it is only 2:30 in the afternoon, much too early for a glass of wine. It occurred to me for less than a nano second that my tears over a television show could be akin to my husband sulking for a day over a Steelers game loss. What’s this?! How in God’s name did the Steelers enter my consciousness? Heck…who cares if it’s too early for wine… I must truly be in a bad way if I’m reduced to thinking of that which I have not a whit of interest in (in fact, borderline loathing would be more appropriate). No! This is infinitely more heartbreaking than the outcome of stupid football game! This is real tragedy! This is love lost, a family broken, a lifetime more of heartache and with it chances of happiness gone up in a cloud of smoke. Ah…the buttons this has pushed for me…. How in the world can I keep watching? I’m heavy-hearted about enough things. It’s time for a kick in the tush; enough of these tears missy! After days of rain, the sun is shining at this very moment so out the door you go with the poodle! A walk around the block now…and let’s try not to think about Drover’s Run, or your dream of riding a horse in such breath-taking scenery, or even how can Tess possibly recover from this tragedy now? In fact, think instead about something more interesting…. ….Like, where can I get a turquoise necklace like the one Stevie is wearing?! The capacity to sympathize, empathize, and enjoy entertainment is part of what makes you wonderful. I’m so glad the swollen red eyes and somewhat disheveled look from an afternoon of malaise didn’t deter you from wrapping your arms around me when you came home. Thanks for understanding!